A bad photo | carpe diem! of not very much knitting at all. The hateful socks are almost finished, with only an inch or so of ribbing remaining. Next will be socks for me (what a surprise) on the small needles. The next garment proper… ah, well. It was going to be this, in a different colourway; I’ve even got the samples. I have no idea whether that sweater would suit me, but I love the design on it. Then Eunny posted this sweater she’s designed for Jamiesons. I’ve been wearing the Endpaper Mitts, smoothing them up my arms and thinking how nice it would be to have a sleeve or even an entire sweater that looked as intricately beautiful as the mitt. And I asked, and there will be a 39″ bust size. I guess that’s sorted. A year ago I’d never have dreamed I’d be contemplating a knitting project like that. 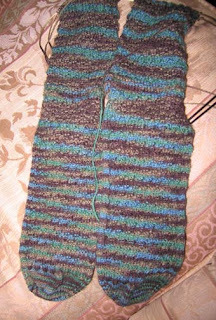 I didn’t even know I’d be knitting socks, confidently devising my own patterns to fit my own feet (I confess those Amalgamator socks are a bit tight on him, but I’m going to block them on his feet. That’ll teach him to over-estimate looseness). Spinning? No way, too complex. Ha. All these things have been achieved in large part because of ‘the internet’ and the many people I’ve met here. Some are special, like Joanne, whose emailed advice on spinning encouraged me to learn this new skill. Most of the rest don’t know me; I’m a lurker, laughing at their stories, inspired by pictures of their work and/or information about techniques. I’ve no idea how many people are lurking here, but I’m curious. So: post a comment, any comment, and I’ll draw names for prizes. How many depends a bit on how many names there are and how much yarn I can bear to part with! This entry was posted in Uncategorized on March 10, 2007 by sarahw. I’m here, I’m in awe of Eunny’s sweater…and really touched that you think I was the catalyst for some of your spinning adventures. I think the fiber is always, at heart, the inspiration.Tomorrow, I get to explore a new spinning group in my own next of the woods. I’m excited. Eunny’s sweater gets my vote too! I am building to to some fair isle too but more like a border for a pair of socks or maybe a sweater! I can’t believe I gave away an Alice Starmore book about 3 years ago but that was before I re-discovered the knitter in me. I hope one day to find the spinner & lurking on the net certainly finds plenty to inspire me. Hi, lurking here too. Have been for quite a while. Love your blog, I probably stop by every lunchtime to see if you have posted. Eunny’s sweater is so lovely it may have to be on my to-do list as well! I’m late, but wanted to add my name to the list. Happy blogiversary! I’m so glad to know you.